Yahoo Screen has arrived on Android to provide its users with video streaming from various entertainment channels — finally. The Android app was debuted today, following Yahoo Screen’s launch on iOS last September. Through the app, users can stream videos that are currently distributed on Yahoo. This includes a wide selection of Saturday Night Live videos, original Yahoo web shows such as Jack Black’s Ghost Ghirls and John Stamos’ Losing It With John Stamos, and clips and episodes from The Colbert Report, The Daily Show, and series from MTV, Spike, and other Viacom properties. Yahoo inked the Saturday Night Live partnership in April 2013, as we previously reported. Unfortunately for Yahoo, competitors Hulu and Netflix have long been available on Android, so it’s a bit late joining the party here. Yahoo Screen has also recently launched on Apple TV and Roku. What a match made in health heaven: A weight management company just purchased a workout and fitness app. Weight Watchers announced today that it has acquired Wello, an app that enables people to attend fitness classes or one-on-one fitness training through any Internet and webcam-enabled device. While Wello’s team and technology will help support Weight Watchers’ core brand and products, Wello’s service will live on independently as well. Wello uses webcams and an Internet browser to connect fitness trainers with people seeking to take a class or book personal training, much as ride-sharing services like Lyft and Uber connect drivers and passengers. “Weight Watchers and Wello share the view that real, person-to-person relationships are essential for meaningful and sustainable change,” said Wello cofounders Leslie Silverglide and Ann Scott Plante. “This is a tremendous opportunity for us to learn from the Weight Watchers legacy and contribute to the company’s future innovation. We’re all excited to join the team,” they said. Although this acquisition may seem trivial, it’s not. It’s actually part of the “digital therapeutics” trend. Digital therapeutics are uses of software to improve health issues. Earlier this month, we reported on Omada Health’s brand new round of funding. Omada Health is also a digital therapeutic and also currently in the weight management category. The company has taken proven diabetes research that says weight loss is an effective method of prevention and reversal, and has created a weight loss program that uses a mobile app and digital scale to guide people through their weight loss. Much like Omada Health, Weight Watchers will now be able to use Wello’s digitally-based approach to fitness instruction in order to help its customers manage their weight more effectively. It will be interesting to see what Wello brings to Weight Watchers’ programs. Being able to scale quickly is one advantage to using software and technology for health management. Wello was founded in 2011 and is based in San Francisco, Calif. The company raised $1 million in seed funding in 2012, and its investors included Kleiner Perkins Caufield & Byers, Rock Health, and Mohr Davidow Ventures among others. If the idea of Comcast buying out Time Warner Cable to become the largest cable company in America wasn’t enough to make you worry about media consolidation, news tonight from the Wall Street Journal just might. Reportedly, AT&T has approached DirecTV to begin “possible acquisition” talks, a deal that the WSJ says could be worth over $40 billion. If it were to happen, it would give the combined company something on the order of 26 million TV subscribers, making it second only to the hypothetical Comcast/TWC combination of 30 million. The long anticipated Box IPO will remain anticipated a bit longer. When the cloud storage and file share company filed its IPO paperwork on March 24, the offering could have been on for early this month, but now it looks like it won’t happen till at least June, the Wall Street Journal reported late Wednesday (registration required). Box would not comment, but it’s easy to see why this is not a great time for an IPO. As the Journal reported, in the past two months, the Bessemer Venture Partners index of 37 public cloud companies has lost $58 billion in market value. The market, which had been forgiving of fast-growing but money-losing cloud companies may be changing. Meanwhile, rumors of companies — from Dropbox to Microsoft — swooping in to buy Box have been swirling on social networks. Yeast, yes, yeast, may hold the key for building better and more secure computer networks. That’s the conclusion of a group of computer scientists at Carnegie Mellon University in Pittsburgh who declared that the defenses contained in yeast cells, and how they’ve evolved to protect themselves from environmental maladies, contain lessons that can be applied to designing effective computer networks and beyond that, helping analyze how secure they are. The study, published today in the Journal of the Royal Society Interface, was conducted by computer scientists from CMU’s Lane Center and the Machine Learning Department of the well-regarded university’s School of Computer Science. The National Institute of Health helped to finance the study. The CMU team said that each yeast cell contains 6,000 genes and that 20 percent of those are considered necessary for their survival. You determine whether a gene is critical by seeing if a cell dies when you remove that gene. Team member Ziv Bar-Joseph, an associate professor at CMU, said that’s how scientists study genes, looking for the essentials for its survival and reasons for its demise. That, apparently, was the reason yeast was brought into the study. Or something like that. 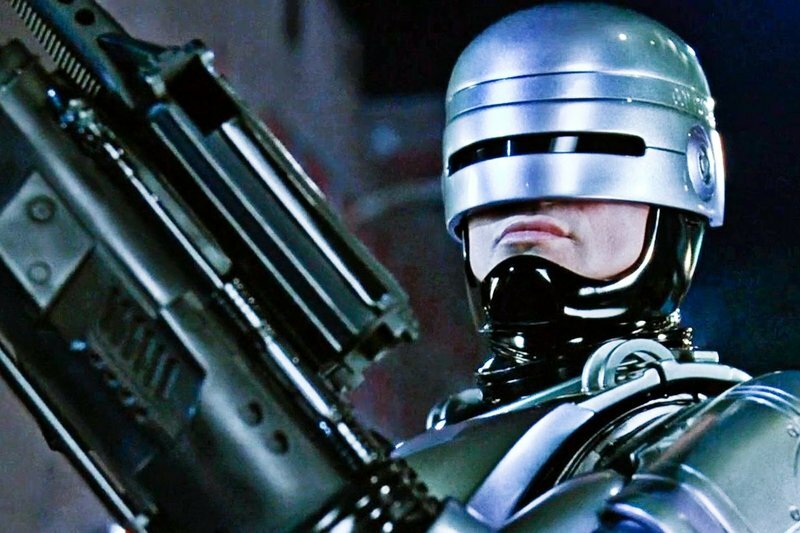 Was 1987’s ‘RoboCop’ intended to be a completely symmetrical film? Many movies follow the familiar three-act structure, but Paul Verhoeven’s 1987 classic RoboCop may have gone further than that. With only one exception, argues The Deja Reviewer, the film is completely symmetrical from beginning to end. From the solitary “RoboCop” title and closing credits, to the placement of action sequences, to the way the film reveals and removes its villains from the picture, practically every scene seems to have been intended to beautifully balance out an equation. You can find out just how those scenes match up at our source link below. Box was rumored to have filed to go public on January 31. On March 24, its S-1 dropped, showing the world quick revenue growth but stubborn and expanding losses. Box could well have launched itself onto public markets this month. But it has fought off that impulse as stocks for cloud companies have faltered in recent weeks. Instead, the cloud-based file-sharing company could end up making its debut on the New York Stock Exchange in June, according to a report today from the Wall Street Journal. Cloud software companies like Marketo, Netsuite, Salesforce.com, Workday, and Xero have tumbled lately. Just take a look at Bessemer Venture Partners’ cloud computing index for the past few months, and you’ll get the idea. Such market conditions aren’t conducive to a successful Box IPO — or for other cloud companies, like Dropbox, which could also IPO in the months to come. But Box can’t wait forever. The company goes through money fast. In the year that ended on Jan. 31, the company registered a $168 million net loss, according to its S-1 filing with the U.S. Securities and Exchange Commission. So the company will need to raise cash eventually, and that means it will likely turn to the public markets sooner or later, where it will trade under the symbol BOX. It’s just a matter of when — and what will happen after that. A Box spokeswoman did not immediately respond to a request for comment. Ambri chief executive Phil Giudice is serious. His Boston-based alternative liquid metal battery startup raised $35 million Wednesday in a C round from a bevy of heavy hitters like Khosla Ventures, Bill Gates, and even Karen Pritzker, of the Hyatt Hotel family clan. Ambri launched in 2010 under a different name, Liquid Metal Battery Corp. To date, it has raised a total of $50 million. It already has secured launch partners, and it is targeting large enterprise and corporations in order to wean them off the grid. “The economics are driving us to the big systems of the world,” Giudice told VentureBeat. Giudice doesn’t mince words — nor is he shy about his ambitions. “We are building a world-class team that is developing a solution to the energy challenges of the 21st century,” he said. Ambri’s clean technology was concocted in the MIT laboratory of Donald Sadoway, one of the world’s foremost experts on alternative energy, and Dr. David Bradwell, Ambri’s chief technology guru and one of the company’s co-founders. Between the two, they are widely recognized as pioneers in America’s renewable energy research. At the heart of Ambri’s clean tech is its energy storage platform. It integrates and stores energy from solar and wind. Each cell consists of three self-separating liquid layers — two metals and a salt — that float on top of each other based on density differences and immiscibility. The system operates at elevated temperature maintained by self-heating during charging and discharging. The result is a low-cost and efficient storage system. The value proposition is that Ambri will reduce electricity costs for customers and reduce the need for costly development of more traditional power plants, like coal for example. One traditional problem with renewables, like solar and wind power, is that they can’t be produced around the clock. Having an efficient storage system is key to making these alternative energy sources practical. The name of the game for Ambri is cost efficiency and savings for clients. For example, the average U.S. household spends about 10 cents per kilowatt-hour. Giudice says Ambri can provide it cheaper. Ambri also promises low costs for building out the platforms. For example, a portion of the funding, $10 million, will be used to build out an entire production facility which otherwise would have cost triple the price, or higher. Previously, the company spent $400,000 developing a prototype factory, building that to make sure producing the technology is viable. Giudice of course says it is. Guidice told Venturebeat that his batteries have “no fade rate,” which means they don’t lose capacity with use. Unlike lithium ion batteries, which in your cell phone, for example, are used for only two years and then tossed in the trash, he said. The company is launching with four major partners: Otis Air National Guard Base in Cape Cod, Mass, which also houses a detachment of the U.S. Coast Guard and Defense Intelligence Agency; the island of Hawaii, in conjunction with renewable energy stalwarts Firstwind; rural tracts of country in the state of Alaska; and New York state, in conjunction with ConEdison. “We went to the most expensive places (in the U.S.) to provide them cost savings by substituting conventional energy sources with renewables and our storage,” Giudice said. Of further note: When the technology was being hatched at MIT, the research was supported by the U.S. Department of Energy, the Office of Naval Research and the Massachusetts Clean Energy Center. For Kholsa Ventures’ Andrew Chung, Ambri is the future of renewable energy. And a model for industry and cities to someday adapt. “Cost. Lifetime. Safety. There’s no technology we’ve seen that will match the cost savings” of Ambri, Chung said. 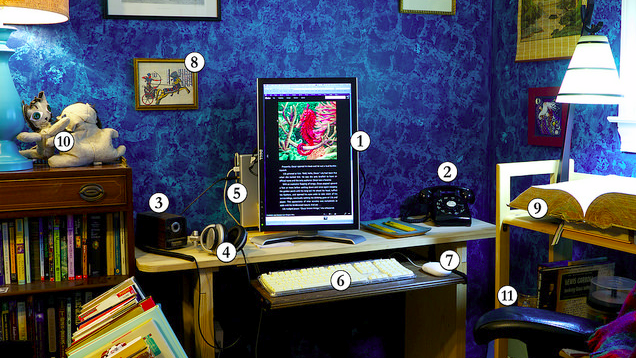 Looking at this photo is like stepping back to a time when things like rotary phones and hefty paper dictionaries still rule the workspace. Flickr user Richard Due has thoughtfully labeled the classic, still-working items in his office for us. Google announced Wednesday that it will no longer sift through the Gmail messages of students, business users and government bureaucrats for targeted advertising purposes—at least for those using its Google Apps suites. The decision stemmed from privacy concerns raised during a California court case last year, in which students and other users of Google Apps for Education questioned the legality of the practice, likening it to wiretapping, even though Google displayed no ads to those users. The company will also implement similar changes for Google Apps users in business and government. The change doesn’t affect individual Gmail accounts. Google will host a Hangout on Air on Thursday, May 1, at 9:00 am PT to discuss the changes to Google for Education and answer any questions. Digital publication network Purch, formerly known as TechMedia Network, shared some interesting financial statistics today that show the company is growing at a steady pace. In addition to operating numerous news sites, like TopTenReviews and Tom’s Hardware, Purch operates a platform that matches up content, advertising, and product recommendations within news and review publications. The platform’s goal is to increased engagement from readers, who may then purchase products or services based on that experience. The company told VentureBeat that it has close to $100 million in annual revenue this year, and seeing annual growth of more than 20 percent. A Purch spokesperson also said the company is profitable, and on track to continue profitability indefinitely. Purch also claims that it has the largest audience of any site in the tech vertical, which would mean that it’s bigger than CBS-owned CNet and Ziff Davis. We haven’t been able to verify that claim. Part of the Purch’s success could be due to Purch’s (then TMN’s) purchase of Bestofmedia last year — which gave it access to well-trafficked publications like Tom’s Hardware, Tom’s Guide, and Tom’s IT Pro — as well as its acquisition of B2B-focused BuyerZone earlier this year. Today Purch also announced that it’s signed an exclusive partnership with digital publisher Mobile Nations, which runs Android Central, iMore, WPCentral, Connectedly, and others. The partnership will bring Purch’s content and commerce recommendation platform to Mobile Nation sites. Founded in 2003, the New York-based company has raised a total of $40.5 million in funding to date. Purch currently has over 350 employees in nine offices across the globe. Qualcomm only started selling Gimbal, its take on Apple’s iBeacon, in December, but just a few months later it has decided to let the Bluetooth proximity beacon fend for itself as part of a separate company. Qualcomm said Wednesday it has found third-party investors for its Gimbal business and will spin it off into an independent company called Gimbal Inc., though it will remain a “substantial” investor. Qualcomm is probably acknowledging that its strength is in selling mobile chips to consumer device makers, not running a business that targets the retail industry. Gimbal, like iBeacon, is intended to create proximity-based networks within buildings that communicate with smartphones when they come in range. For instance, Gimbal could notify a customer of specific promotions as soon a shopper enters a particular store department, or it could automatically load up a frequent customer’s loyalty card as soon as he or she arrives at the register. Though a relatively new technology, we’re starting to see beacons of all sorts — not just those using Apple’s technology — make their way into malls, department stores and even stadiums across the country. Qualcomm said it expects to fully separate from Gimbal in May. It didn’t name the specific investors participating except for the i-Hatch LBS Fund, a group of corporate strategic investors that includes barcode and RFID company Zebra Technologies and sports conglomerate AEG.